The world food price crisis of 2007/08 shook global food governance. Pressured to find solutions for unexpected prices increase of several food products, many initiatives were launched at the global level. One of those was the reform of the United Nation’s Committee on World Food Security (CFS), who transformed itself from “the most boring UN body of all” – in the words of an experienced diplomat based in Rome – to the foremost inclusive international and intergovernmental platform for food security, with substantive participation of different actors including member states, civil society and private sector. That was 2009 and there was a general sense of urgency in addressing claims that over 1 billion people were going hungry worldwide. The reformed CFS was well positioned in this debate, by giving voice to all actors, notably those most affected by food insecurity, and transitioning from an inactive talk-shop to a leading intergovernmental body. Through the Committee, member States were able to endorse key policy documents on two major food security issues: land tenure (the Voluntary Guidelines on the Responsible Tenure of Land Fisheries and Forest in the Context of National Food Security – VGGT) and investments (Principles for Responsible Investments in Agriculture and Food Systems – CFS-RAI). Now, five years after the reform, the CFS just had its 42nd Plenary last week and we, as well as many other participants, sensed a change in the air. 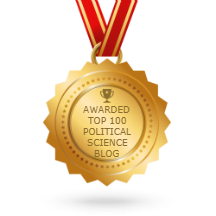 First, the initial ambition of the CFS seems to be fading away, and it appears as though the CFS is now entering a phase characterized by a lack of clarity on the future relevance of its decisions. Second, members continue to disagree about which direction the CFS should take – illustrated by relatively weak decision on Monitoring and Evaluation and the mild debates on the positioning of the CFS vis-à-vis the new development agenda launched by the approval of the Sustainable Development Goals (SDGs). The decision will not see the CFS featuring prominently in the SDG agenda for another two years, as some have expected. Third, the multi-stakeholder format of the reformed CFS is being put into question, as demonstrated by one very important intervention of the Civil Society Mechanism (CSM) in the closing session of the CFS plenary. Failing to address controversial topics, such as agroecology or bioenergy, as its strength is based on forging consensus such as those achieved on land tenure and on investment. In what follows we provide some initial reflections on how the CFS currently finds itself at a crossroads. This looks like a great opportunity. If I was not teaching that week, I would certainly apply. The organizing committee is now accepting applications to be part of this task force. Graduate students, post-docs, and other junior research staff with an established professional social media presence (preferred) or an interest in cultivating one are encouraged to apply. Selected junior task force members will receive FREE registration (courtesy of the support of CICCA) to the conference, however all other costs must be covered by the individual. Please submit the completed application form along with your CV toc.alman@elsevier.com no later than Wednesday 15 July 2015. 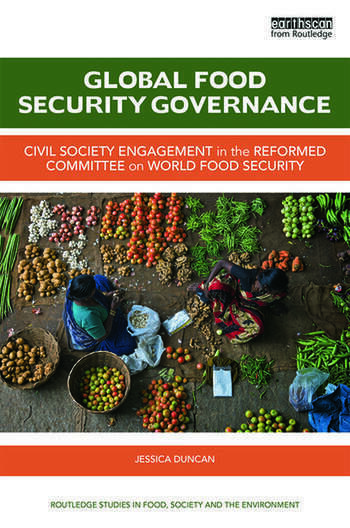 I am most excited that my book Global Food Security Governance: Civil society engagement in the reformed Committee on World Food Security is now available for pre-order! It is part of the Routledge Studies in Food, Society and the Environment. It is not exactly priced for accessibility so I encourage you to request your library to order it instead. That way you can access it for free! You can do that at this using this link and click on “Recommend to Librarian”. “In Global Food Security Governance, Jessica Duncan provides a timely and thoughtful analysis of the recent reform of the Committee on World Food Security and its evolving role in international policy-making on issues of hunger and nutrition. Both empirically rich and theoretically grounded, the book highlights the central role of civil society in reshaping food security governance and assesses the challenges facing the CFS as its work moves forward.” – Jennifer Clapp, Canada Research Chair in Global Food Security and Sustainability, University of Waterloo, Canada. “The Committee on World Food Security inaugurates a new breed of global governance: one in which civil society co-design institutions with governments. This is a superb assessment of this transformative moment.” – Olivier De Schutter, United Nations Special Rapporteur on the right to food (2008-2014). “The inadequacies of the world’s food system became only too clear when the banking crisis unfolded in 2007. Prices went volatile; hunger rose; politicians floundered. In this book, Jessica Duncan gives a wonderful account of the pressures in, on and around the UN’s Committee on Food Security, reformed as a result. The account she gives us both celebrates democratic attempts to make the food system more accountable, and points to tensions which remain. It’s a great read with sober messages.” – Tim Lang, Professor of Food Policy, Centre for Food Policy, City University London , UK. “With global food security emerging as one of the issues of the twenty-first century it is essential that obstacles to improved food access be identified and addressed. In her timely and engaging account of the Committee on World Food Security, Jessica Duncan reveals how powerful global actors are undermining the Committee’s attempts to develop and pursue progressive policies aimed at assisting the world’s hungry. Importantly, she also demonstrates how civil society is confronting global neoliberalism and – through the Committee on World Food Security – is helping to create a new framework for improved food security governance. This illuminating and very well-documented book is a ‘must read’ for those who are hoping for, and working toward, a fairer, more food-secure world.” – Geoffrey Lawrence, Professor Emeritus of Sociology, The University of Queensland, Australia and President of the International Rural Sociology Association. The UN Committee on World Food Security (CFS), the central and most inclusive institution of the global governance on food and agriculture issues, today endorsed the Principles on Responsible Investment in Agriculture and Food Systems after a two year open, transparent and participatory process by a wide range of stakeholders. Civil society, including Oxfam, participated throughout the process. But the final adoption of the Principles remains the sole responsibility of the CFS Member States. “The member governments of the CFS have failed here to promote responsible investment in global agriculture. These new principles are too weak, vague and in a number of areas are actually worse than the standards that already exist. Unscrupulous investors could find ways to use the principles to cover irresponsible deals. “Oxfam regrets that the Principles fail to meet the ambition. They won’t work to promote global food security. We will keep campaigning to ensure they are not used to weaken human rights. We will continue to pressure investors and governments to account for their impacts on human rights, food and nutritional security, as well as on our environment. However we do believe that these Principles will not help us much in those efforts,” Mr. Kesteloot added. Oxfam says the new Principles allow human rights to be subordinated to trade interests. They will allow investors to pick and choose the elements they prefer to implement or to ignore. They fail to provide clear guidance on how investors should avoid land-grabs. “Governments refused to apply Free, Prior and Informed Consent (FPIC) for all affected communities and that omission is frankly deplorable. It should be clear that all investors have clear legal obligations to protect human rights and to avoid environmental damage and land-grabs” concluded Mr. Kesteloot.